There’s a British saying, which uses as its basis that buses—to those patiently waiting in a queue—always come in threes! This does seem to be true recently regarding new satellite constellations. Over the past year, I have caught myself talking about Carrier ID (CID) again and again—the time has come to change the record. Radio Frequency Interference (RFI) continues to be a significant problem that affects both satellite operators and end users alike. There is much coordinated effort to combat the issue on the part of operators and industry groups such as the Satellite Interference Reduction Group (sIRG) and the Global VSAT Forum (GVF). Satellite interference is a relatively new topic for VeriSat. We have worked in the industry for a number of years, providing test equipment and monitoring solutions for interactive satellite communications and VSAT technologies. Carrier ID (CID) has been a topic of conversation in recent years because it is one of the most effective means to combating satellite interference. Across the industry, we are seeing a growing importance and emphasis of data for a wide variety of purposes. Interference is no exception. If we have the correct data, and the ability to analyze and use of that data effectively, we can make great headway in resolving interference. The broadcasting sector is experiencing a thrilling moment, filled with changes and new developments of all kinds, from technology and consumer habits to business models. Last year, 2014, was a most exciting year for Earth Observation (EO) companies. We witnessed some massive changes in the market that included the arrival of Skybox 1 & 2 data, the entry of Google via their purchase of Skybox Imaging, the launch of Worldview 3, the authorization for the sale of satellite imagery with resolutions down to 25cm, and the launch of several other initiatives that are all aimed at putting more commercial imagery on the market. 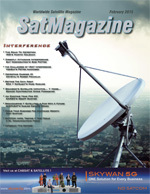 A GL Communications Focus: SATCOM — Apps, Testing + Test Tools..., The unique aspects of the satellite communications channel, especially of geosynchronous satellites, will be reviewed in this article. Ever since Sir Arthur C. Clarke brought his proposal for geostationary satellite communications to the world in the 1945 edition of Wireless World magazine, their use has brought hope, prosperity, entertainment, and knowledge to humanity, all starting with the launch of Intelsat’s Early Bird, the first commercial geostationary communications satellite in 1965.